One of the easiest ways a man can approach you in a nightlife setting is to strike up a conversation with you while you are at the bar. He can stand next to you while he is ordering a drink, and wait for an opportune moment to ask you a question or make a comment. The approach is casual, low-pressure on both parties, and gives either of them a subtle way to remain in the conversation (pretend they were going to stay there anyway), as well as a graceful way to exit (i.e. "Well, we have our drinks now - have a good night!"). One of the worst ways a man can approach you in a nightlife setting is to come up behind you and tap you on the shoulder, or grab your arm through the crowd to get your attention when you aren't noticing him. It is abrupt, catches you off guard, puts you (and him) on the spot, and offers no easy exit. 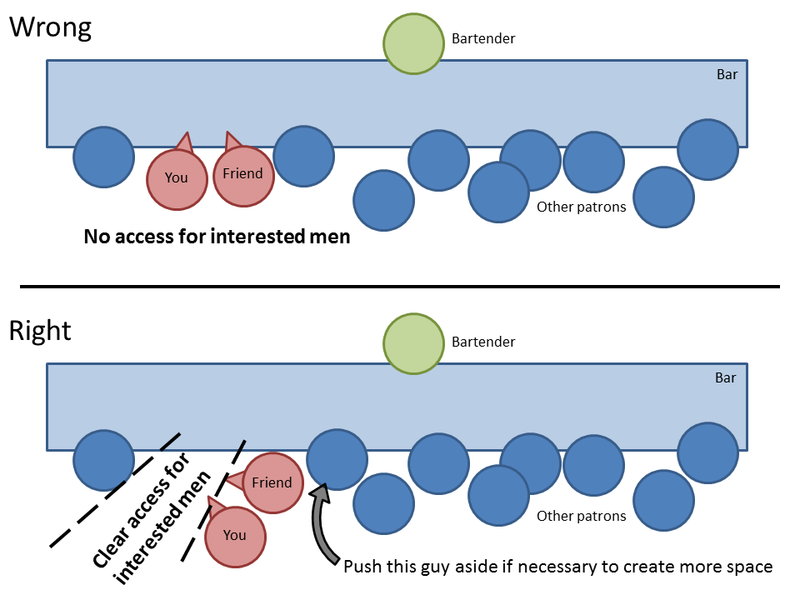 There is a simple thing you can do to facilitate being approached at the bar, and prevent the need for a man to grab or tap you and put you on the spot. Next time you are out, create space at the bar next to you or choose a spot next to empty space - ideally the only empty space. While there may not be any men noticing you or looking for a way to approach, it would be a shame if simple logistics prevented one from accessing you. The image below clearly illustrates the technique. In addition to the placement, notice the way the girl's bodies are angled in an effort to be more open to men who might approach. This "open" body language signals to men that you are open to meeting new people (usually they notice it subconsciously - but they notice). As the night progresses and the bar gets more crowded, there will be more pressure pushing people into your "vacuum," and you will find yourself having to move around from time to time in order to always be posted up next to an empty spot. This can sometimes be a good thing since it gives you an excuse to spend time in different spots and be seen by different men. If the bar gets too full, you can apply the same principle as you stand overlooking a railing or balcony, though not having the drink transaction working for you makes this slightly less desirable. Keep in mind that staying in bars too late is asking for trouble, so I am assuming here that you will be gone before this becomes a major problem. This isn't a magic trick for picking up guys. It isn't going to actively attract men. It will only facilitate the approach of the ones that are already interested. Rather than trying it out this weekend with grand expectations, I suggest making it a habit that you and your best girlfriends do by default, without expectation, every time you go out. "Push this guy aside if necessary to create more space"
If you are not interested in him, try not to touch him at all. My experience is that coincidental pushing, or even an elbow, will be used to strike up a conversation. Your body touches his, he turns around, "hey, how are you?" and now you're stuck with the job of getting rid of him. In the meantime, other guys are even less likely to approach. I actually use this tip myself occasionally and what I do (though admittedly it is different for a guy) is back into them slowly, creating the extra space over the course of two or three minutes. He takes a step aside to get closer to the bartender momentarily, I do also - then he's stuck there and I get the extra space. But yes, if it induces the guy you are trying to move to hit on you, you'll have to shut him down quickly so that he won't prevent other guys from approaching. In the same sense that you shouldn't let a guy waste your most eligible years, you also shouldn't let a guy waste your most eligible hours at da club. Please do your shy guy post soon! Curious to hear what advice you have! It's written. You'll see it soon. Hi Andrew, have a great year ahead. I hope that your post about the game (or the attitude) for women in their 30s is written, also, I can't wait for it. andrew, i'm generally uninterested in relationships and would normally find this kind of stuff ridiculous but this blog is seriously a gold mine. i'm going to forward it to my sorority. i have no idea how you simultaneously are (or seem) like a normal straight guy yet became so insightful about women! What other nightlife advice do you have? The Bay area- San Fran? That's hard. Beautiful city! But, you will have a tougher time there with the demographic, not conducive to husband shopping. Highly concentrated homosexual population, that has superseded Philly? So, not only are the pickings slim, the rare straight men have their pick of 10s, and use it to their advantage, this might create and even more skewed dating demographic than NYC, see Andrew's prior female/male ratio post on that a couple weeks ago. If you are beautiful, you might not want to do things 'outside of the box' but a strategy consultant would have you shake things up to get RESULTS (husband) ....if you are open minded enough, you might want to try online dating, a Christian site (or any religious) - to get to people that are serious about commitment. Do that next, if it doesn't work, start sending resumes to other cities. Any other place will be easier- fiscally and romantically :) GOOD LUCK! I was going to type up advice on how to 'go to the bar solo' but, most women wouldn't be comfortable in that position (you will look and feel too vulnerable) unless you pick up a part time bartending gig (then you are there for work, respectable). But, you can hang out a Starbucks solo, or work out at the gym w/out headphones? You could also meet single girlfriends (younger women) a variety of ways- but too indirect, and that is a two step process- meet drinking buddies to go to the bar (where the pickings are slim any ways w/random chance meetings)...hence the online advice, more strategic (what you really want is a husband so you can stop thinking about all of this) than just waiting around to meet some one in a bar. Oops! The comment below about SF was intended to be a response to this thread, but I posted it as a separate comment. Best of luck, lady. Thanks so much to you all! Those are some great ideas! 1) If you are in SF, spend weekend nights outside of the neighborhoods full of B&T bros on bar crawls. Instead of the Marina or North Beach, go to the bars on Divis or Polk. Instead of the Inner Mission, go to the Lower Haight. Or skip the city and go out in Oakland. You catch my drift -- off the beaten path, there are higher quality guys. I would recommend finding a new friend who will accompany you on these outings because it's a lot easier than going out alone at night. Also if your friend lives closer to the bar, you can sleep at her place and save your cab money. 3) Meet guys at larger social events outside of bars. You can probably pressure your married friends to do stuff like Dolores Park movie night, Oktoberfest, Brews on the Bay, or whatever. 4) Go to shows. It's not weird to go alone and you can always talk to people about the bands. Look for the mid-tier (not superexpensive) venues like Bottom of the Hill, etc. 5) Re: the recommendation above about Starbucks and the gym. You won't meet guys at Starbucks outside of the financial district. You might meet guys at Coffee Bar, Four Barrel, Ritual, Philz, Sightglass, etc etc etc. People don't just hang out at Starbucks in SF, but my friend met her boyfriend when we sat next to his friends at one of the places I just listed. You may meet guys at the gym, depending on your neighborhood and choice of gym. If you want to do that, avoid Gold's and Crunch: Gold's is too gay and at Crunch there is too low of a male to female ratio. Try the bay club, ucsf mission bay, 24hr fitness (depending on location), maybe the embarcadero Y. You can take this all with a grain of salt as I am still a single 20-something lady, but a mix of these tactics helped me meet some pretty great guys before I moved cross-country last year, and they continue to work for my friends who live in and around SF. You used the term "open body language" a few times in your post. While I understand the concept, it's difficult for me to actually implement this open body language when I'm talking with men. I'm sometimes very shy (especially around attractive men) and it's a huge hindrance for me. I look nervous and anxious. I think it gives guys the impression that I'm not interested, but that couldn't be further from the truth. Any practical advice for me? What type of body language should I start practicing in these situations? Even if he can tell I'm nervous, I want him to know that I'm still interested. 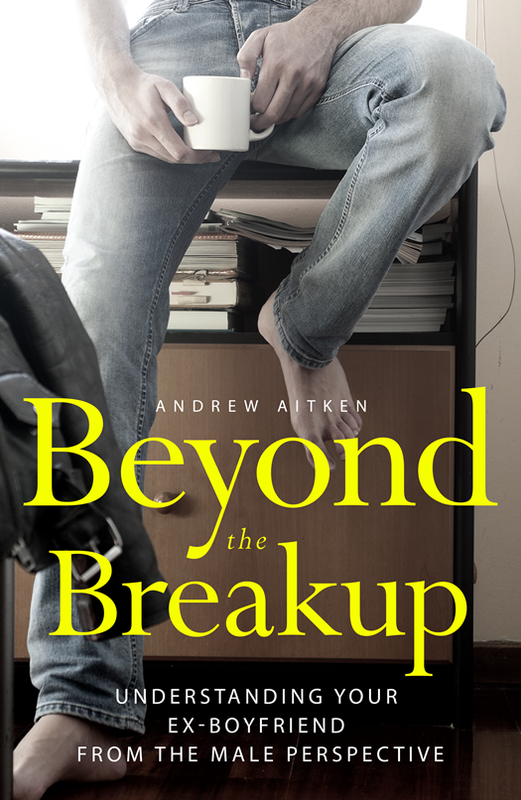 Andrew, what if women end up occupying that space who look better than you? Hey Andrew, I went dancing at this cool bar last night, and tried to be more aware of guys there. What I kept noticing was many guys dancing next me or hovering around. They would keep looking at me smiling and then just back away eventually. Some would even say hi, and then run away! Were they actually interested or ??? Hi Andrew, Regarding guys at a bar: At my typical spots, there are a few guys/group of friends that I typically see. At various times, I've been approached by members of this "pack." Do guys discuss or comment to each other if 1 guy happens to know of my history with another friend/acquaintance? Should I be paranoid that they see me as an easy score and that is why multiple members approach me? If the bar gets too full, you can apply the same principle as you stand overlooking a railing or balcony, top online strategy games. Andrew, can you comment on a female going to a bar alone? Specifically, what should she do to be approachable presuming she is already following your suggestions on being attractive? Ladies, I suggest you drop the bar scene if you actually want to meet a decent man. The only thing you'll catch there is a good STD. And if you want to make some REAL catches, consider approaching the man that you are really interested in instead of waiting and hoping that he'll come to you. I know I know, these are new and unfamiliar concepts on how to get a partner. But like I said, if all you can think of is going to bars, then goodluck. More than likely the guy you'll find drinks too much as well. You gotta be an idiot not to realize these things and you deserve what you get. It also goes against your whole stereotypical roles for male and female but you try to claim you are breaking traditions but really you are just confusing yourselves. Actions speak louder than words and no amount of words will convince me that women have changed much at all, and haven't even changed for the better. At least back in the days women knew how to send positive signals, bat their eyelashes and give nice warm smiles. Nowadays you got women pretending not to notice you and playing hard to get, men responded by being hard to get themselves, and now you women are desperate for attention. You get what you deserve. This place is cozy and trendy, the exposed brick wall behind the bar looks rich with age. I loved the live DJ playing great jams that I could move my shoulders to, yet also have a great conversation with friends. Loved it.